Promoting your business can be done in multiple ways, but one of most common methods is to do it through word of mouth. Doing so effectively spreads the word about your business and it only needs people to be talking about it to get them to try out a certain product or service. As such, business owners who want to spread information about their business offer incentives to those who promote it in any way they can. An example of an incentive is that of a referral coupon. 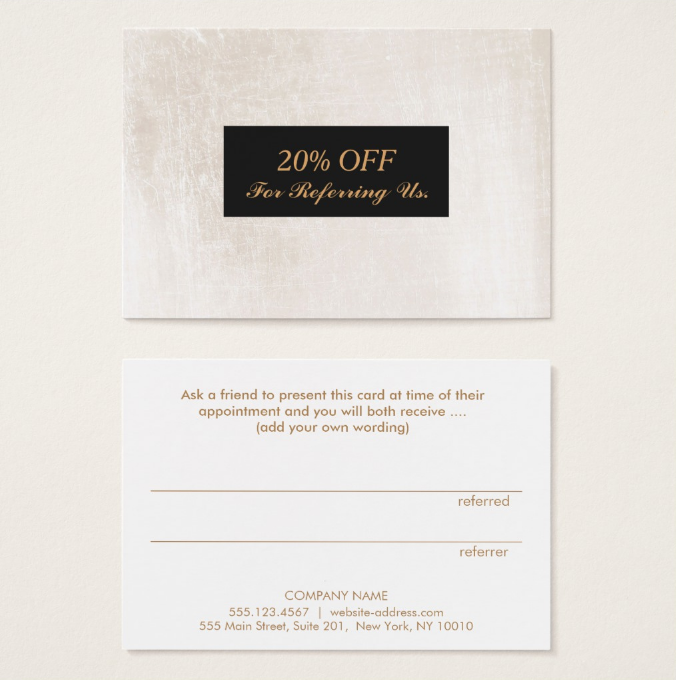 But, what exactly is a sample referral coupon? 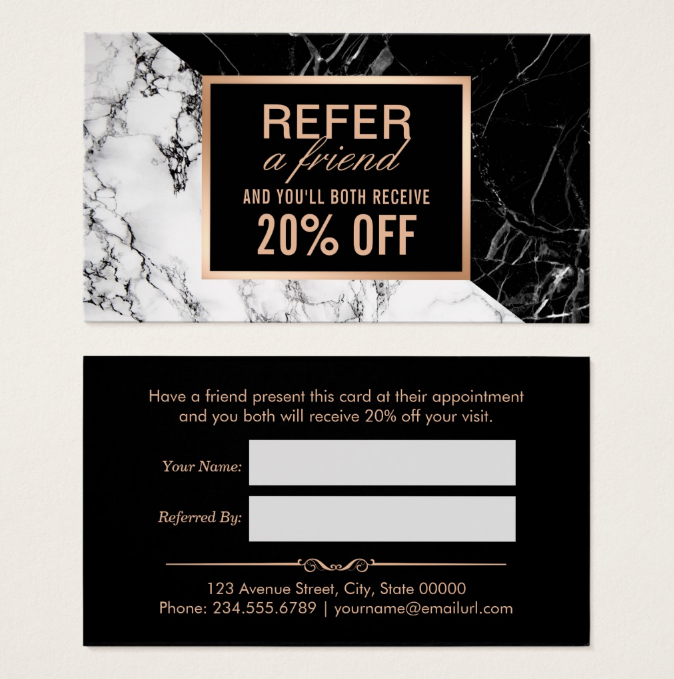 A referral coupon is the type of coupon that gives a special offer to both the one who referred the business and the person they referred it to. The offer could be anything, such as a percent discount on any item or service or a specific product that they can acquire for free. So, if you have a business that you want to be known and reach a wider audience, then you definitely need to use referral coupons. 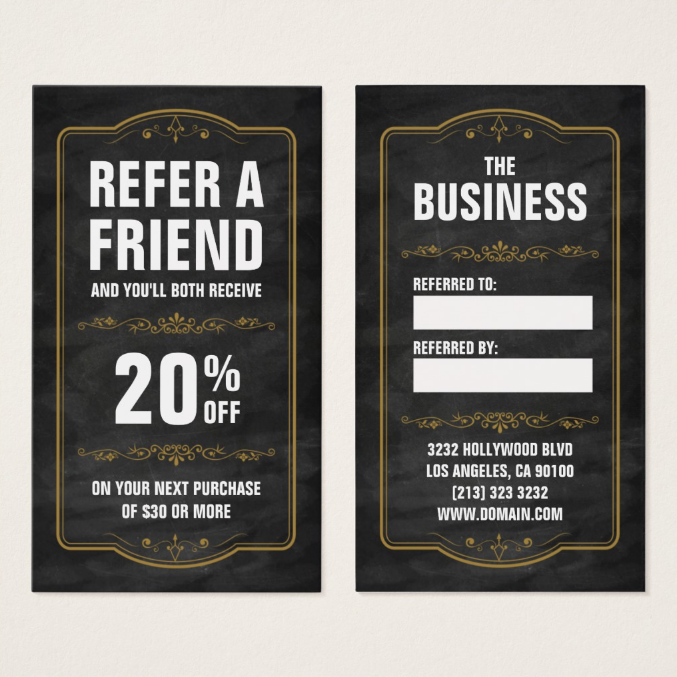 With that said, you need to make your referral coupons look as compelling as the offers on your coupon. The designs that we have prepared specifically for this matter are all attractive, aiming to help solidify your reputation. Check them out below! 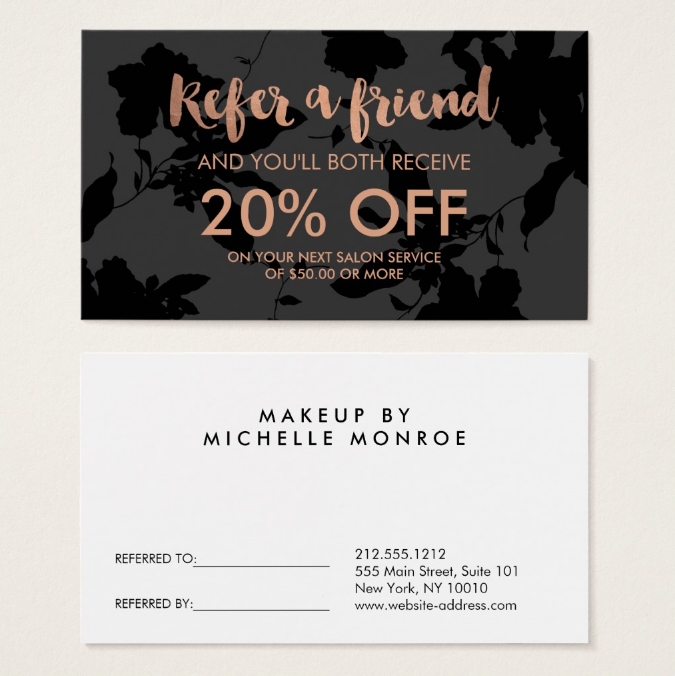 A referral coupon has to be both compelling and convincing. It has to be compelling in a way that the offers can drive a person referring your business to keep on doing so. It also has to be convincing in a way that your referral coupon would look like it is legitimate and that is isn’t just a sham. In this part of the article, we will show you some tips on how to make your referral coupon design so enticing that people would be encouraged to take up on your offer. Pick a theme. Themes can sometimes be seen as gimmicky as most designs can go without it. But, using a theme adds up flavor that would spice up your referral coupon to a new level. Aside from the additional entertainment value, having a theme helps the customers easily identify what kind of product you are selling or service you are offering. 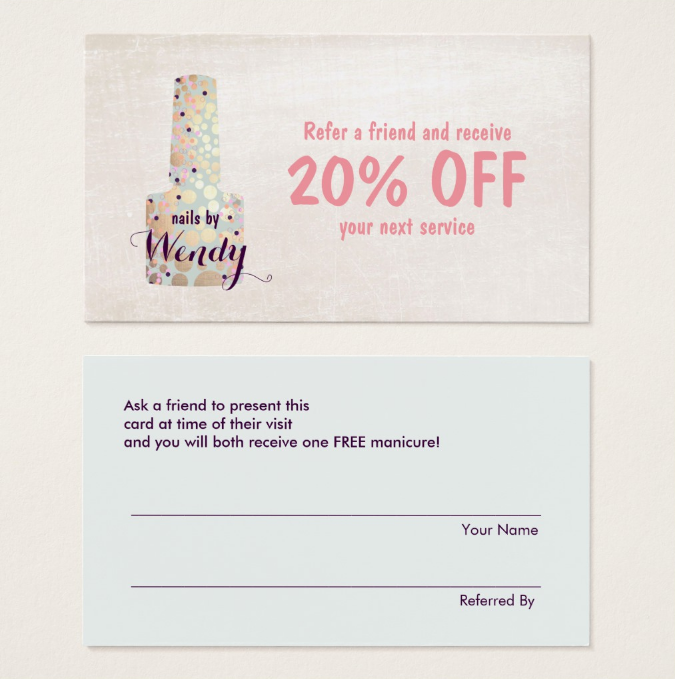 For example, having various images of nail polishes would only mean that the referral coupon is for nail services without even reading the content of the coupon. A straightforward approach to the design helps lessen questions asked by the customers. You may also see homemade coupon templates. Use appropriate colors. With or without the theme, colors are one of the key elements that one has to consider when it comes to design. Combine colors that would accentuate the beauty of the design. Also, choose those that are complementary. This is a method that can be used to safely establish a visually pleasing design. But, if you are up for something risky, you can go beyond regular color combinations and create on your own. This will be a hit and miss, but if it’s successful, then you have gained a new trick up your sleeve that you can use in the future. You may also like coupon templates in a word. Plan the layout. Planning the layout is as important as implementing the design. Having a proper layout allows you to position necessary elements with ease. Also, having an arranged structure creates a tidy and balanced look at the design. You may also like simple coupon templates. 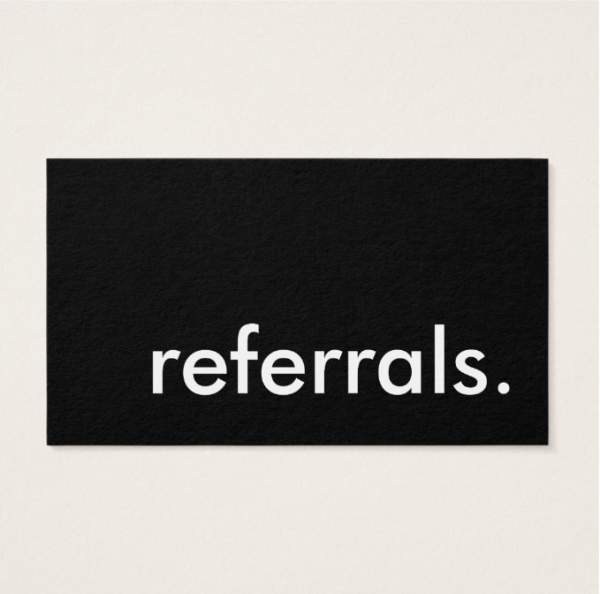 The referral card is your main weapon in convincing people to help you spread the word about your small business. In what way would it be able to do so? The answer simply lies on your offer. If the incentives that people will get in gaining a customer are worthy enough to actually help you, then they would not hesitate in spreading the word and it will also give them enough motivation to continue doing so. Also, not only does it give motivation to the people helping you out but it will also allure prospective customers to try out your product or service. To know more about the incentives that you could implement for the referral coupon, read on until the end of the article. What incentives can you put on your referral coupon? The main point of referral coupons is to widen the customer reach and to give incentives to those who helped promote the business. It is done to keep the drive going to spread about the simple business. There are few incentives that you can give to your promoters, and it will depend on you, as the business owner, on which way you think will be the most beneficial to you. Most referral coupons have discounts on them. Commonly, the person who referred the business to another one gets the incentive. But, in terms of referral coupons, both the person who referred and the one being referred to get to have the incentives. This not only motivates the person who referred your business but it also entices customers to buy your products and hire your services with the given discount. The discount could either be a percent discount or a certain monetary amount that can be used to deduct from the original price of the item or service. You may also see sample blank coupons. Who doesn’t want to acquire something for free? This could be anything that your business can offer. Sometimes, it can be simple items on your stock that can be given away without putting that much damage to your sales. Also, these items can be something from an old stock that instead of throwing it away or selling it, you can use it as a reward for those who refer your business to people. It’s a great way of clearing up space in your storage area and it avoids wasting the products by giving it for free. A giveaway isn’t necessarily done daily. You can set a certain quota that the person needs to reach before they can acquire the free item or service, which is the most practical way of doing so. Membership points are one way of keeping your customers to stay loyal to your business. And, as members, they are given certain privileges that only members can obtain, one of which is the point system. In a point system, the member can acquire something in exchange for the accumulated points. These points are accumulated by referring your business to people. To do so, you can assign a referral coupon with a certain amount of points. So, whenever the member can compel someone to try out your products and services, the points will be added to their account. You may also see word coupon templates. Offering cash in exchange for referring your business can be costly. In order to avoid spending too much on the referral program, you can limit the amount of money that you can offer in exchange for the referral. To add, you can limit the number of referrals that people can use to exchange it for cash. For example, if the person has invited five new customers, you can reward him/her with, perhaps, five dollars for a job well done. Of course, the money should be limited to a certain amount to avoid overspending for the referral program. You may also see coupon design templates. Get those referral coupons ready! In the business world, everything is about competition. You have to stand on your toes all the time for any possible changes that you might use to your advantage and avoid possible damages to your business. You also need to attract as many customers as you can to maintain and support your business for a long term. With that said, you have to promote it using any possible means, which in this case, is with the help of referral coupons. You may also see sample coupon vouchers. 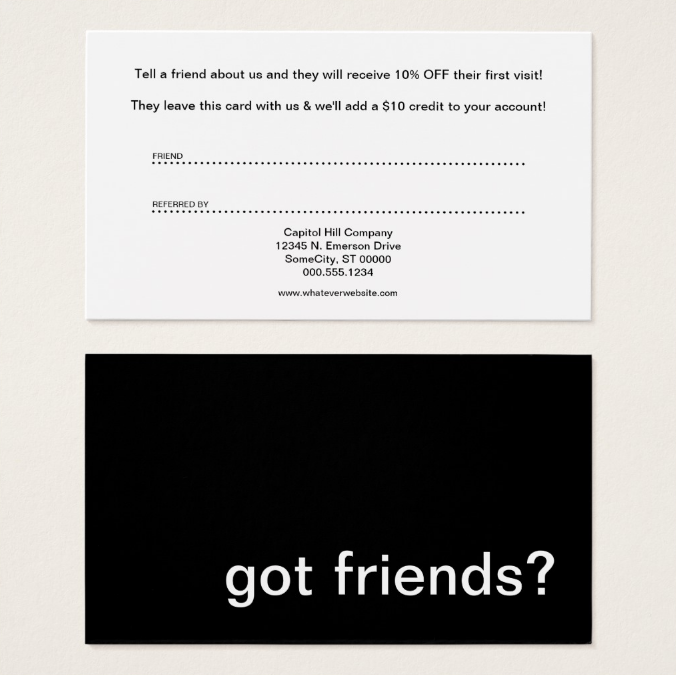 Referral coupons can be used to your advantage if utilized properly. Create an attractive design for the actual coupon and put in a compelling offer to maximize its potential. In terms of design, you can use any of the templates that we have provided. We have included designs that will cater to various types of businesses. Just make sure that you put on your personal touch to create a distinct look that everyone will instantly recognize. You may also see sample handmade coupon templates. We hope that you found the right design for your referral coupon and we wish you all the best and success in your business! Good luck! You may also see coupon samples.